Artist and engraver: Burch Junr., W.W. 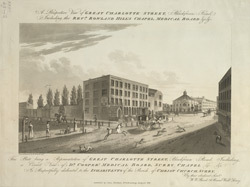 This is a view of Blackfriars Road in Southwark (previously called Great Surrey Street) showing Dr. Cooper's Medical Board, the Surrey Chapel etc. The Surrey Chapel was a polygonal chapel built in 1783 for non-conformist preacher Rowland Hill (1744-1833). He was a charismatic orator, drawing audiences of up to 1000 people to the Chapel. The Chapel no longer stands as it was destroyed in the Blitz.